It's been another busy week in the library, after closing down the book fair and getting the room back to normal, we were able to visit Wonderopolis again. If you haven't looked at this free web site yet, you really need to. Every day is a new wonder and they run the gambit. This week alone, we wondered about leukemia (awesome, goose bump video), going on a quest, predicting the future and wrist watches. Lots of great predicting, wondering and questioning by all grades. 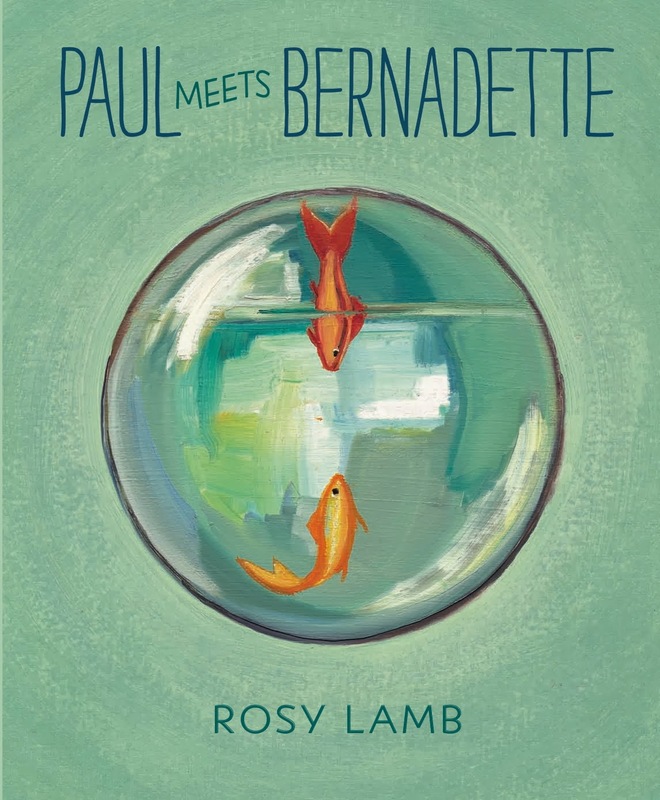 In THE PIT we enjoyed the book Paul Meets Bernadette a story of goldfish love by Rosy Lamb. Paul's life is pretty boring, swimming in circles all day until Bernadette "drops in" and shares her view of the world. It's fun to look at the world through a gold fishes eyes and one 4th grader came up with an interesting observation about the final thoughts, I love it when kids see through the words and think on a higher level. Last weekend was the Dublin Lit Conference and I got some big news to share with the 3rd, 4th & 5th graders. 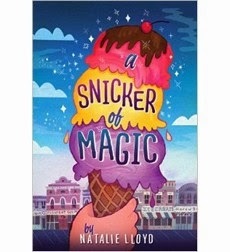 While talking to Tami from Fundamentals Book Store in Delaware, OH I learned that Natalie Lloyd, author of A Snicker of Magic, one of my all time favorite books, is coming to the Delaware Library. I mentioned that I would like to get up to hear her and Tami mentioned that she would like to visit a couple of elementary schools while she is here and I mentioned that Bailey would love to host her! So now, we are in the preparation stages to host Natalie Lloyd on her visit to central Ohio, very exciting! We've been observing a run on the Who Was...series of biographies, so my super aide Yvonne and I made a move. First we ordered about 25 new titles that we didn't have and then we found an empty shelf where we can feature them. They tend to get lost in with the other biographies so by pulling them out the kids will be able to find the ones they are looking for more easily. I love that they will read any book in the series regardless of who it is about. They are learning about great people from history that they wouldn't normally be interested in. 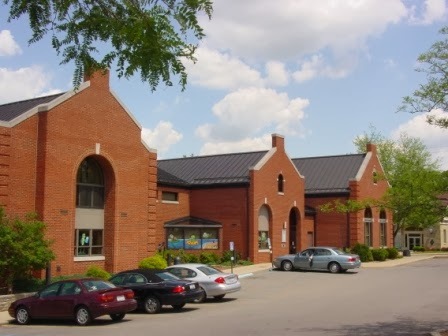 I really love it because as a kid, the biographies were my favorite books at the Ashland Public Library. I think I read every one of the junior biographies on the shelf several times. I still love a good biography. That pretty wraps up the week, now we are all on Storm Watch to see if yet another blast of the white death is headed our way over the weekend. The Slice of Life Challenge - Count Me In! Let's see, what is on my "to do" list for the next few weeks? That's right; count me in for the 2014 Slice of Life Challenge! There are probably a hundred reasons that I could use to excuse myself from posting daily, but I am committing to writing something each and every day. At a writing retreat I attended last summer, one of the motivational quotes I received said exactly that: "I commit to writing something each and every day." That card sits on my desk, right by my computer, and is, unfortunately, often overlooked. Not so this March. I'm going to make good on my promise to honor this quote. I look forward to joining my Slicing community again. I have missed all of you, the stories you share so eloquently, and the conversations we have through comments to each other. Thanks for understanding my absence; thanks for welcoming me back. 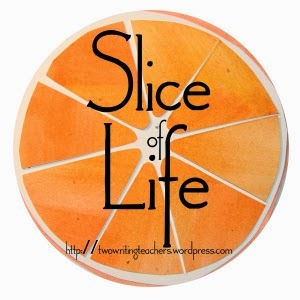 To follow the Slice of Life Challenge, stay tuned to the Two Writing Teachers blog to see the amazing posts that are written. The Challenge begins this Saturday, March 1. We just closed out our second Scholastic Book Fair for the year, and as always, I discovered a wonderful surprise on the shelves. Actually, I can't take credit for it, it was Lauren, a 5th grade super reader and Newbery Club member. She brought A Snicker of Magic by Natalie Lloyd to the counter to purchase because it reminded her of books by another of her favorite authors, Wendy Mass. I read the back and some reviews on line and decided it was a must read for me too. I wasn't disappointed! Felicity Juniper Pickle, her sister Frannie and their mom don't stay in one place too long. Their mother has the urge to roam. She paints murals for towns and this allows her to travel a lot. Felicity doesn't enjoy the life style and longs for a home. The story begins with them returning to Midnight Gulch, TN, the town where Mom grew up. It's the home of Aunt Cleo who gives them a place to stay. That's where the magic of this book begins. Midnight Gulch used to be magical, people could make themselves disappear, bake secrets into pies and sing down the rain. Now, though, the magic seems to be missing, or at least not so powerful, there is just a snicker of magic left. Felicity believes that if she can solve the mystery of what happened to the magic, her mom will want to stay and their traveling days will be over. With the help of her friend Jonah, they begin investigating the mystery. Using Jonah's knowledge of the town history and the people who live there and Felicity's power to see and collect words, Natalie Lloyd weaves a wonderful tale. The characters all wind around each other, just like in any small town, everyone knows everyone else's business and everyone is related to someone in the town. The story just keeps weaving in and out with twists and surprises in each chapter. Natalie Lloyd's creative use of language and detail is simply amazing. I found myself wanting to highlight lines and phrases because of the artistic beauty of the words she put together. In addition to the words she chooses, Natalie Lloyd's characters form one of the best book casts I've read in a long time. Her characters came to life for me, and as I read it, I heard their voices in my head, just like when I find a great read aloud picture book. Natalie Lloyd is an artist who puts her reader right in the middle of Midnight Gulch, TN with the mountains surrounding them. I'm recommending A Snicker of Magic to all of my 4th and 5th graders and to any teacher who is looking for a great class read aloud, or just a book to enjoy for themselves. I love this book! Like most teachers, I strive to build a strong, close-knit reading community with my students. I actually have two classes, a morning and afternoon language arts group. We have shared our reading lives from Day 1 of this school year. I know a great deal about my students as readers, they know a great deal about me as a reader, and they know a great deal about each other as readers. When reading posts like this, who wouldn't love their job?!!! How lucky I am to be part of this reading community! 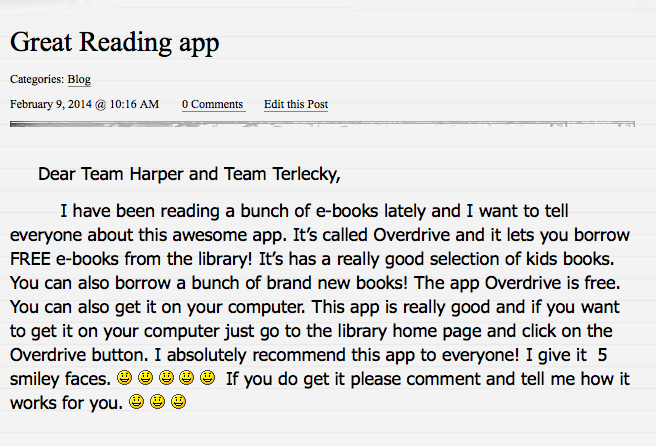 My students and their reading lives continue to amaze me every day. For more Slices, head over to Two Writing Teachers blog for the roundup. All series or sets of books with the same cast of characters. There is something about the familiarity and safety of those books. They also make great jumping off points to get kids into other stories. That's why I'm always on the look out for new series to add to our collection. The Imaginary Veterinary fits that bill perfectly! Ben Silverstein is "banished" to stay at his grandfather's for the summer. Like any kid he is seriously bummed that he won't be playing video games with his buddies all summer, but instead, helping his grandfather in a small, middle of no where town. Shortly after arriving he is advised to avoid that trouble maker, Pearl Petal. When they both start seeing the same unusual figure flying about town, they get together to investigate. What they discover leads them to the closed down factory on the hill. Upon further exploration they find that it has been transformed into an animal hospital. Not just any animal hospital, a hospital for curious creatures. In the first episode, The Sasquatch Escape, Ben leaves the door open and a large hairy beast escapes. Ben and Pearl are then assigned the task of tracking and trapping the creature to return him to the hospital. Author Suzanne Selfors has tapped into something here. It's a series and it's about things kids are fascinated with, strange creatures. 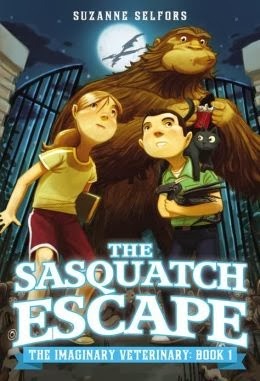 The Sasquatch Escape is already flying off the shelves and has a list of students with a reserve on it. I'm sure the second in the series, The Lonely Lake Monster will be the same. How Do I Get My Boy to Read!? If I had a quarter for every time I've been asked this question over my 30 years of teaching I could have retired with only 20 years of teaching! My most common response has been, "If I knew that, I'd be on the speaking tour right now making more money than I do teaching!" There have been countless professional books and blogs written to this topic and we still don't have the answer. In fact, my own son has never been a reader despite all of the efforts I've made over the years. One of the most common things I hear from people smarter than me, is that boys don't relate to the characters in books. Most books seem to be written for girls. I don't disagree with this sentiment, but there are a number of authors who have a boy bent and seem to be trying to write for that audience. Recently, one of my parent volunteers told me that she is having a hard time finding books for her son. Most of the books she has found or that have been recommended to her have boys that either are athletes or who always get into trouble. Her son doesn't fit either of these profiles so I pulled some books for her 3rd grade son that have main characters that aren't particularly athletic and don't get into big trouble. She was looking for boys who like to play outside and build things and take pleasure from just being a boy. I thought I'd share the titles here and maybe the Literate Lives readers will have some other suggestions. These were the ones I pulled from our shelves quickly, but I know I can come up with more if I really think about it. If you have some to add, let me know, I know a parent who will be very happy!